Posted on Wed, Mar 7, 2012 : 10:07 p.m.
Michigan goaltender Shawn Hunwick, above, was named second team all-CCHA on Wednesday. The Michigan hockey team finished second in the CCHA regular season standings. On Wednesday, the Wolverines learned they did so without a single all-CCHA player. The CCHA released its all-conference team and no Wolverines were among the first-team selections. Senior goaltender Shawn Hunwick was a second-team selection. "He’s earned it and good for him. 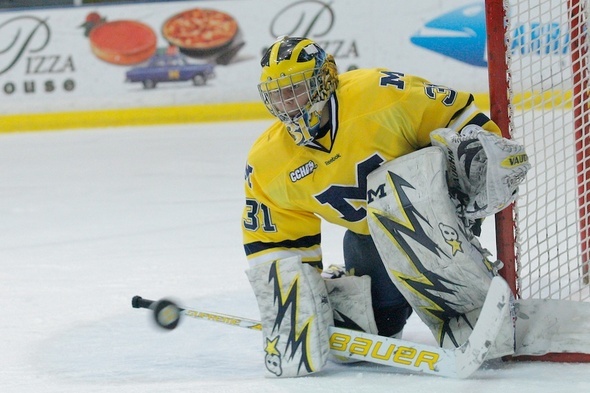 This is his first year being the starting goalie and he’s done it all year,” said Michigan coach Red Berenson. In his first year as the full-time starter, Hunwick appeared in 35 games and posted a 21-10-3 record with a career best five shutouts, 2.04 goals-against average and .932 save percentage. He ranks first in the CCHA in wins and shutouts, second in goals-against average and fifth in save percentage. Hunwick is tied for second nationally in wins, fourth in save percentage and ranks tenth in goals-against average. Ferris State's Taylor Nelson was the first-team goaltender selection. He posted a 2.08 goals-against average and .927 save percentage for the CCHA regular-season champions. Michigan juniors Lee Moffie and Chris Brown were honorable mention selections. Moffie is third on the team in scoring with 29 points (six goals, 23 assists) in 36 games this season and first among defensemen. He is first among CCHA defensemen in assists and is tied for second in points. Brown has 28 points (11 goals, 17 assists) in 36 games, ranking fourth on the team in overall scoring. First-team forwards included Reilly Smith of Miami, Tyler Gron of Northern Michigan and T.J. Tynan of Notre Dame. Michigan State's Torey Krug and Ferris State's Chad Billins were the first-team defensemen. Smith and Krug were unanimous selections. Thu, Mar 8, 2012 : 3:54 p.m.
Second-team? Hunny has put up monster numbers this year, has played in 430 more minutes than Nelson, and is up for the Hobey Baker.